Scientists can't really know what a child is thinking, but they are interested in the brain processes that happen in educational settings. To that end, a new study in PLOS Biology compares the brains of children and adults, using "Sesame Street" as a way to test what happens on a neurological level during a popular TV program aimed at learning. "We’re kind of honing in on what brain regions are important for real-world mathematics learning in children," said lead study author Jessica Cantlon, assistant professor of brain and cognitive sciences at the University of Rochester. Participants included 27 typically developing children, ages 4 to 10, and 20 adults between ages 18 and 25. Each participant took part in one or more of the three components to the study. Researchers focused on what happens in the brain during mathematical lessons. They used functional magnetic resonance imaging (fMRI) to measure the neural activity in participants. In one part of the experiment, children and adults watched the same 20-minute montage of clips from "Sesame Street," and the fMRI scanner measured their brain activity for the duration of the video. Some clips were related to counting, while others were about colors, animals and other non-math topics. In a different task, participants had to determine whether the stimuli they were shown were the same or different, such as faces and numbers. Children were also given standardized IQ tests after the scanning. Researchers found that adultlike brain responses tended to show up in kids who demonstrated higher math and verbal knowledge levels. A brain region called the interparietal sulcus appeared to be linked to mathematics, as activity in that area tended to increase during math-related "Sesame Street" segments. The researchers do not have enough evidence to say that this is a causal factor, however. In other words, they do not know if these neural patterns are the cause or effect of learning. A different brain region called Broca's area was associated with verbal knowledge, which has been well established by other scientists. More from CNN Health: Does mom's depression affect baby's language? The sample size was small for this study. Although this is typical for fMRI studies, especially given the cost involved in such protocols, more research needs to be done to confirm these findings and better explain their role in the learning process. 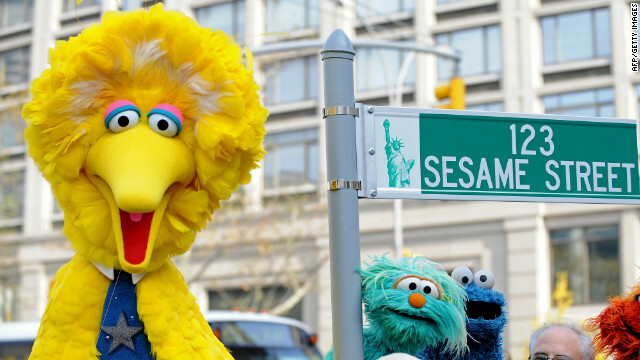 Cantlon and colleagues did not compare the neural responses to "Sesame Street" with any other real-world educational program or classroom setting, which could be another area of inquiry. However, it is hard to control exactly what happens in a "classroom setting" scenario, which is an advantage of showing everyone the same TV show montage. Also, the age range of the children who participated was broad; a future study could focus on particular age groups, Cantlon said. "It would be nice to put a finer point on that, and test children in narrower age windows with narrower skill sets to see if we could find even finer relationships, perhaps in subsections of this interparietal sulcus region, in certain types of math skills," she said. Newsflash: people who are interested are interested. New flash: you're an imbecile. One of the most useless studies in recent years. What does this have to with anything relating to the real world? We already know those who engage in math and science are significantly smarter and more mature than those who don't. This doesn't add anything to the conversation on child rearing that we don't already know. Whoever commissioned this wasteful study should be fired from their job pronto. When Michael Faraday demonstrated a dynamo to the British Parliament in the early 1800s, showing that electrical current could be generated by spinning a wire inside of a magnetic field, one of the Parliamentarians asked "Of what use is it?" Faraday replied, "I don't know, but I'll wager that some day you'll tax it." We now have electric utilities providing electrical power all across the globe, and billing us for it. This study is research into basic principles of science (neuroscience in this case), building evidence to answer the question "Is this part of the brain used for that function?" It's a yes or no question, and its answer leads to further questions that deepen our understanding of the world and ourselves. No one is sure what use it will be yet, but the research isn't a waste. Someday, someone will find a way to make money from it or the questions that follow. Why is it that every scientific article on CNN immediately evokes the "it's a waste of money" comments? These comments usually seem to be code for "I did not understand the study well enough to understand its function," or "my depth of scientific understanding is so limited that I can't understand the value of anything other than direct translational research." I simply don't understand why commenters would be so confident in advertising their ignorance. I frequently read articles outside of my area of expertise, and can't immediately see the value. However, it would never occur to me to declare with false certainty that the study was useless, the researchers were clueless, etc. If you really don't understand the value of the research, why not just ask, rather than attacking? In this case, an understanding of which portion of the brain process which type of information could have numerous applications - for example, in facilitating the diagnosis or treatment of specific brain disorders. They should have used adults from a wider age range. It's pretty obvious from the ages (18-25) that they just used their own students out of convenience. This furthers my opinion that one thing wrong with the world is kids don't watch enough Sesame Street (and Mr. Rogers for that matter). I AM SO IMPRESSED WITH WHAT YOU ARE DOING. YOUR DAD WOULD BE SO PROUD AND MOM IS TOOTING THE HORN. Given the significant increase in the number of students with learning disabilities in the U.S within the last 50 years, any advances in the field of neuroscience can only further our understanding of the relationship between specific brain processes and learning and hopefully lead to the creation of effective educational interventions. One thing is clear. Sesame Street is a great educational program that stimulates the brain. I wonder if it also triggers areas in the brain that relate to creativity and literacy too? The opportunities afforded through fMRI technology serve as a wonderful compliment to thoughtful studies like this one. This is precisely what science is for, making incremental steps in uncovering the dark corners of human understanding. The doctor who ran this study and all of her colleagues throughout the academy are the reason civilization moves forward. Fine work here. Super interesting. @Daniel: How do you manage to power your computer in that cave? fascinating work. can't wait for the follow up studies on this. In the words of Albert Einstein, "If we knew what we were doing, it wouldn't be called research." Hi there, after reading this remarkable article i am also cheerful to share my familiarity here with colleagues. Appreciating the commitment you put into your website and in depth information you offer. It's great to come across a blog every once in a while that isn't the same old rehashed information. Great read! I've saved your site and I'm adding your RSS feeds to my Google account. Thanks on your marvelous posting! I truly enjoyed reading it, you might be a great author.I will make sure to bookmark your blog and definitely will come back from now on. I want to encourage continue your great posts, have a nice day! I am realy pretty pleased to go to your blog site. Now I am located which I in fact want.